waterRIDE™ TERRAIN was developed to create usable Digital Elevation Models (DEM’s) from very large ALS or LiDAR terrain datasets, on demand. It has been used to create tiled DEM sets for entire Local Government Areas, including one project where there were 10,000 tiles of raw XYZ data (approximately 250GB), equating to approximately 10,000,000,000 points. 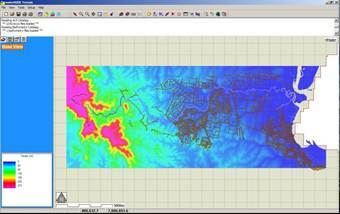 waterRIDE™ TERRAIN employs an innovative approach to developing DEM’s through it’s “Dynamic Elevation Assignment Approach”. This approach uses the concept of relative point density of the source data (ie the number of source data points in each target output cell). Where the relative density is low, the tool will interpolate the elevations from a triangulated TIN surface. Where the relative density is high (a number of data points in each cell), the tool will assign elevations using an averaging function, thereby overcoming traditional sampling limitations in dense source data (such as with Krigging or inverse distance approaches). In this sense, the DEM is built to provide the best quality for the specified output cell size, on a cell by cell basis. As this can vary between the intended use of the DEM, the tool provides a very simple and flexible way of generating the best DEM to match your requirements. Through it’s simple interface, users can extract a DEM to suit their requirements as/when required, without the need for expert involvement. Alternatively, experienced users can batch process DEM’s to serve common uses, whilst maintaining flexibility to readily handle specific requests. waterRIDE™ TERRAIN automatically handles your source data, including integrating bathymetry and updated data into your DEM’s, ensuring that you will always have access to the most current information. waterRIDE™ TERRAIN carries out processing “behind the scenes”, thereby allowing the user to generate usable terrain models, without having to actually “handle” the large source datasets themselves. By employing the Dynamic Elevation Assignment Approach, waterRIDE™ TERRAIN is able to create high quality, usable DEM’s from very large LiDAR terrain datasets. The images below present the same set of source data elevation data points (the stars). 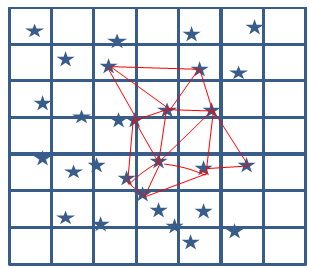 The output grid on the left has a high relative density of points as indicated by the number of source points in each cell. 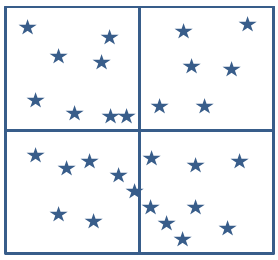 The image on the right has a low relative density of points as there is generally no more than 1 point in each cell, with some cells not containing any points. Are usually a mixtureof high and low relative density when considered on a per cell basis. 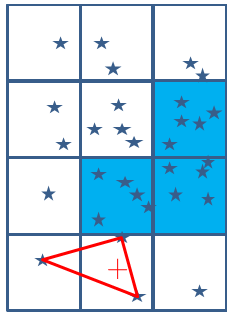 waterRIDE™ TERRAIN will utilise the best approach for assigning an elevation to each cell (eg the image to the left shows both triangulation and averaging (blue cells) used. waterRIDE™ TERRAIN is available as a standalone, “per machine” license only.